Extreame Savings Item! 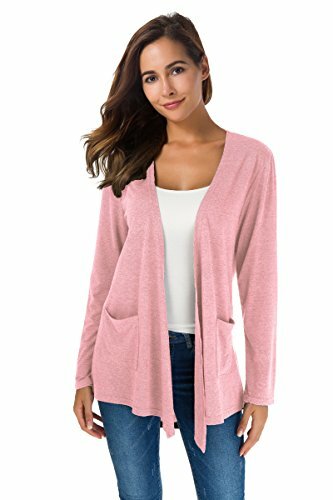 Save 48% on the NB Women's Extra Soft Natural Classic Long Sleeve Irregular Hem Open Drape Style Cardigan Pocket (Pink, XL) by NB at Femi Store. MPN: 43230-55126. Hurry! Limited time offer. Offer valid only while supplies last. Women's Classic Long Sleeve Open Front Draped with Two pockets CardiganOpen front drape cardigan.Lightweight soft fabric with stretch for comfort. Open front drape cardigan.Lightweight soft fabric with stretch for comfort. Classic slip-on elegant cardigans all season long and for any occasions. Good Stretch / Soft Fabric / Casual design,open front and long sleeve.Trendy and elegant item which is suitable for any occasion. HAND WASH COLD WATER / HANG OR LINE DRY!To Ensure your order, PLEASE REFERENCE THE SIZE CHART BELOW!